If there is one overwhelming theme to gaming in 2012, it seems to be the rise of eSports and competitive PvP. MOBAs attract millions of players and tens or even hundreds of millions of watchers logged into livestreams. Prize pools for competitions grow ever larger, and more and more games are jumping into the fray. Including, apparently, Guild Wars 2. For players like me, GW2 is primarily about the PvE experience—the normal arc of leveling a character from 1 to 80 and exploring the world and story while I'm at it. 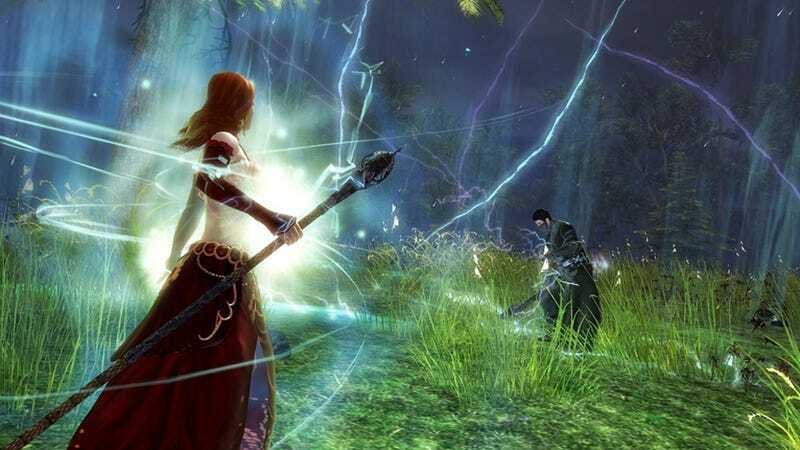 However, GUild Wars 2 also includes a fairly robust PvP experience, and today ArenaNet announced the first steps they're taking to build it out into a competitive esport experience. In addition to the current free automated tournaments, the baseline PvP that exists in Guild Wars 2 today, ArenaNet is adding a system of paid automated tournaments, designer Jonathan Sharp explained on the game's site. The paid tournaments require tournament tickets, which can be purchased or won in free tournaments, but award not only more tickets, but also gems, the secondary currency used in GW2's real-money shop. Teams training for paid tournaments will also be able to rent and use custom arenas, Sharp said. The arenas can be set to public or private, and can be used for training, practice, and so on. We design sPvP maps with commentators in mind. We think about streaming and how our game will do on streams when being learned by new players. We watch eSport replays/streams in the office. We watch GW2 gamecasts on Youtube. We think about how people will organize tournaments (small and large) within custom arenas. We talk about eSport matches while we're at lunch. We think about how to best get new players into the game, while also making sure professional players have a way to grow their fame. We think about the best way to show high-level matches to the masses. Really…we just think a lot about eSports. Not just for GW2, but we think about growing eSports around the world. Paid tournaments and custom arenas are coming online "in the near future," so if you want to turn your skill into gem rewards, now's the time to find four friends and start your team.